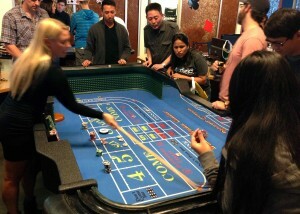 Casino party games offer a great opportunity for beginners to learn playing without the pressures of a real Las Vegas casino. For example, if you have ever been to one of our casino parties where there was a craps table, you may have heard some crazy phrases referring to the roll of the dice. Some do serve a purpose, but for the most part they are said to add humor or spice things up. But just so you can get an idea of how the game works, we have outlined some basic craps call outs. Below is a list that our dealers use or have heard in Las Vegas Casinos. Three: “Craps,” “ace-deuce,” “ace caught a deuce”,”three craps three,” “Acey-deucey, loosey goosey.”, “Australian Yo (it’s the eleven down under)”. Four: “Little Joe,” “little Joe from Kokomo” “ace trey, the country way.” Hard Four: “Ballerinas” , “hit us in the tu tu,” “Hard Four”. Six “2×4, the lumber number”, “Sixie from Dixie”. Seven: “Seven out, line away”, “Six One, you’re all done”, “Three Four, Out the Door”, “Cinco Dos, Adios”, “Three Four, we’re all poor”, “Six Ace, end of the race”, “Seven’s a bruiser, front line’s a loser”, ” Five two , you’re all threw”,”One roll, no butter” (a seven rolled right after making the point.) “, “Benny blue, you’re all threw” ,” two five, cant stay alive.” “New shooter, Same amazing dealers”. Eight: “Eight is Great”, “Eighter from Decatur”, Hard Eight: “Hard Eight”, “Dirty Hairy” “The square pair”, “Forty- four, pays more”. Two: “Pair of A-holes”, “Swallow the COME, spit twice on the FIELD”. The dealer’s job is to keep the game moving so these call outs are meant to make the game fun for players and keep them engaged. You take ’em, you lay ’em, you place it, you COME. When the dice is no longer on the table for you to throw, the dealer will call out with one of the following. When people first learn to play craps, these random phrases are confusing and overwhelming to players who have no idea what they mean. This is why having knowledgeable dealers who know the finer details of each game is beneficial for your guests. 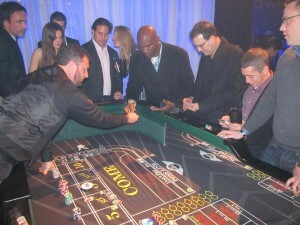 To ensure your guests have a good time playing the casino party games, be sure to ask your rental company if they have dealers who can teach players. Let them learn how they should approach the game with a winning strategy. You want your guests to have a good time and no one likes to loose all their money.